Hurley, whose father was part of the famous Munster side that defeated the All Blacks in 1978, progressed through the Munster academy into the senior squad and made his debut against the Scarlets in the Magners League in 2006. 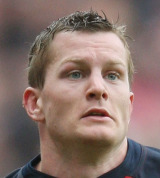 The fullback/wing made his debut for Ireland against the United States in Santa Clara in May 2009. Having failed to add to his caps in the meantime, Hurley he was called up for the Ireland squad for the 2011 Six Nations.